Today in our this blog,We will discuss about How to Refund the e-Stamp Paper. The Refund of e-Stamp Paper can be done but before the limitation period gets expired. There is a limitation period of 6 months after that the e-Stamp Paper can not be refunded. So, if you are going to refund the e-Stamp Paper make sure that it fits under this criteria. Self Attested Copy of I.d Proof. Affidavit on prescribed proforma on Rs. 10/- stamp paper. Indemnity Bond on prescribed proforma on Rs. 100/- stamp paper (provide Indemnity Bond only if the e-stamp paper has been signed by both the parties). Prescribed refund proforma in duplicate duly signed each on Rs. 1/- revenue stamp by the applicant. Note: If the applicant is not in the position to move in the Office for the process of refund then he/she can provide the authority letter duly affixed with Rs. 2/- Court fee stamp. Stamp Paper UN-used OR Spoiled. As per the Order of Court, the e-Stamp Paper needs to be refunded. If the Stamp Duty has been deducted twice on the same document due to any technical issue. Mistakenly paid Stamp Duty to another Department apart from concerned department. Cancellation of e-Stamp Paper by court due to the reason that judicial stamp paper is required not non judicial. Cancellation of the Agreement with another party. So, these are few circumstances in which the application of refund of e-stamp paper can be acceptable. So, if you are going to refund the e-Stamp papet then firstly its recommended to have a look at the circumstances in order to avoid the rejection of application. How Much Stamp Duty is refunded by the Department? The Stamp Duty is refunded by the concerned Department after deducting 10% of the Total Amount of the Duty Paid. So, this is all about the Refund process of e-Stamp Paper. If you have any queries regarding this then Feel free to comment on our blog and we will surely help you in best possible manner. Today I purchased E-Stamp under article 23 conveyance for Sale deed. Now I don't want to sale the property but want to gift it. Can the same e stamp used for the purpose of gift deed or have to cancel it or can we get new e stamp instead of old e stamp. Please guide me. SIR, MY FATHER WANTS TO GIFT HIS HOUSE TO ME(DAUGHTER).I PURCHASED STAMP PAPER OF RS.144400/.WE TYPED THE MATTER OF GIFT DEED ON IT. BOTH PARTIES SINGED ON IT.BUT BEFORE APPEARRING IN FRONT OF REGIESTRAR WE DECIDED TO CANCELL THIS AS OTHER FAMILY MEMBER OBJECTED.WE APPLY FOR CANCELLATION OF STAMP PAPER AND REFUND.BUT SDM REJECTED OUR CASE.WE GOT OUR E-REGIESRATION FEE.BUT STAMP PAPER REFUND REJECTED.PL GUIDE US WHAT TO DO.THANKS. ASHOK KUMAR.JANGPURA DEHLI-14 MOB.9818980607. SR.PLEASE SEND ME FULL DETAIL FOR REFUND OF E STAMP PAPER. Hello sir I purchased E-Stamp for lease deed. Now I don't want to sale the property but want to gift it to my son Can the same e stamp used for the purpose of gift deed (article change) Names are same for first & second party. Please guide me. I got my refund voucher.sdm office dwarka(Delhi) Now what should I do Where should I go? Mr. Narendra Juneja, I have similar issue as you, wanting to convert sale deed e-stamp to gift deed e-stamp. Will appreciate very much, if you could guide me about this. Help from anyone else will also be appreciated. 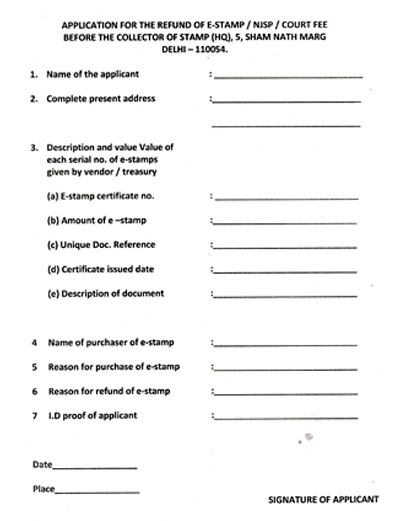 Hello Mr. Narendra Juneja, I have similar issue as you, wanting to convert sale deed e-stamp to gift deed e-stamp. Will appreciate very much, if you could guide me about this. Anyone else knows about this, please help me.